"It's very tight," Sebastian Vettel said Friday after setting the fastest lap in FP2 in his Ferrari. "I think Red Bull looks a bit more competitive here, which you would expect on this type of circuit, and then I think it is very close between us and Mercedes." But it was not so tight in FP3 on Saturday other than Valtteri Bottas (Mercedes) getting within 0.059 of a second of repeat fast man Vettel. And the Red Bulls were off the pace. However, many drivers encountered traffic on their fast laps and therefore did not clock representative lap times. The line-up for the weekend was: Mercedes – Lewis Hamilton and Bottas; Ferrari – Vettel and Kimi Raikkonen; Red Bull TAG Heuer – Daniel Ricciardo and Max Verstappen; Force India Mercedes – Sergio Perez and Esteban Ocon; Williams Mercedes –Lance Stroll and Sergey Sirotkin; McLaren Renault – Fernando Alonso and Stoffel Vandoorne; Renault – Nico Hulkenberg and Carlos Sainz; Toro Rosso Honda – Brendon Hartley and Pierre Gasly; Haas Ferrari – Romain Grosjean and Kevin Magnussen; Sauber Ferrari – Marcus Ericsson and Charles Leclerc. Ricciardo had been quickest in FP1 on Friday while Vettel topped FP2. Leclerc was the first out in FP3. The ambient temperature at the start of the 60-minute session was 82 degrees Fahrenheit (28 degrees Centigrade) and the track temperature was 127 degrees Fahrenheit (53 degrees Centigrade). Raikkonen headed out early on the ultra soft compound Pirellis and clocked a 1:17.057. 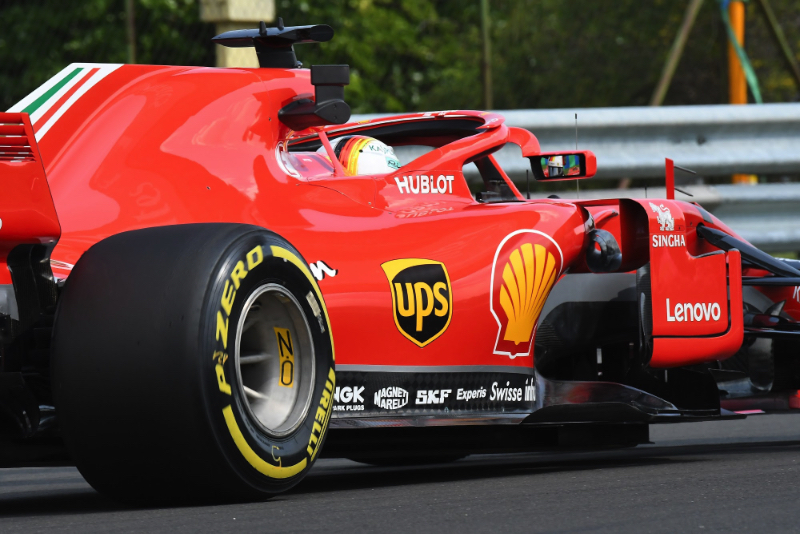 But Vettel went a whole lot quicker as he turned a 1:16.343, which was almost half a second better than his best time on Friday. "The red car is fast," Mercedes tweeted, stating the obvious. Bottas, in the silver Mercedes, was currently second with a lap of 1:16.793. Ricciardo tried the ultras but ran into traffic. His teammate Verstappen ventured out on softs but was only sixth fastest behind Vettel, Bottas, Raikkonen, Hamilton and Ricciardo. Grosjean, Sainz, Hulkenberg and Leclerc rounded out the top 10 at the halfway mark. And now most of the drivers were in the pits preparing for full-out qualifying simulations. Vandoorne wouldn't be going out soon as his McLaren was in pieces. Raikkonen was the first of the front runners to have a go on new ultras, and he went second, 0.112 behind Vettel. Then Bottas beat both Ferraris with a time of 1:16.229. Hamilton's lap went awry when he spun across the curbs at Turn 6. But there was nothing skewed about Vettel's attempt that yielded a 1:16.170. Next, Bottas spun and tapped the barriers at Turn 7. Fourteen minutes remained when Ricciardo began his ultra run. He stayed fifth. Seven minutes later Verstappen tried the ultra soft Pirellis for the first time in FP3, but he only moved up one place to fifth. There was lots of traffic out there. Less than three minutes remained when Ricciardo did another lap on the ultra soft tires. He moved back to fifth. And so the top 10 at the end of FP3 were: Vettel, Bottas, Raikkonen, Hamilton, Ricciardo, Verstappen. Sainz, Hulkenberg, Grosjean and Gasly.